When I first read NPR's investigative report about nursing injuries, I was shocked that this injustice had been festering so profusely but yet these deep wounds remained invisible to the public. How could this be??? Especially, since nurses are such a beloved fixture in American culture. They are often visible figures of professional femininity within popular culture and they grace the screens of both movies and television shows. In That 70's Show, the lovable Kitty was a devoted nurse and even in the Notebook, the fiery love interest, Allie, briefly nursed injured soldiers in the Red Cross. Perhaps this is why nurses were used by NPR as figureheads for this issue although the more marginalized nursing assistants and orderlies are injured “more injured than any other occupation”. But then I realized, that was the issue! These dominant and one dimensional images of nursing feed society with cultural narratives about “feminine” professions, thus inducing a blind spot to the full realities of nursing and stifling society's ability to respond to the suffering of nursing employees. Society is not able to hold key institutions accountable. It's difficult for reality to compete with and push against the flood of box office illusions. I decided to google images for nurses and was inundated with a collection of smiling faces engaged in "safe" tasks like holding a stethoscope, calmly writing on a pad, holding the hand of a frail yet healthy elderly woman, holding a clean baby and taking temperature of "safe" patients. When I used the keyword nursing, the smile was still superimposed on faces while taking heartbeat of a seemingly healthy girl holding a cuddly teddy bear, giving bed site comfort and holding a needle. The smile dominated and was a static feature despite who was posing as a nurse while the back was hidden. Only one type of expression was showcased, indicating that nurses only deal with one type of scenario. Nursing is multifaceted, therefore the one dimensional dominant images of nursing crowds out and subverts the reality. Consequently, spines are crushed in silence beneath a smile. This one dimensional conception of nurses and nursing have gender implications. Ninety percent of nursing employees are women while almost 70 percent of physicians are men according to the Department of Labor Statistics. Historically based structures, attitudes and the logistical challenges of motherhood reproduce these gender divisions. Therefore nursing is overlay with themes about womanhood and nurturing. Since nursing is represented as a feminine profession, it is intertwined with harsh dichotomies between masculine and feminine. There is a division between nursing, safety, and femininity versus power, danger and masculinity. However nursing requires a delicate balance of feminine and masculine qualities. Yes, there is smiling but the heavy lifting shouldn't be a mere footnote on society's narrative of this profession. There needs to be acknowledgement of both stories and the realization that nursing and nurturing are also dangerous. Since these gendered views of nurses are implanted within cultural narratives, their workplace, the hospital, is not structured to support the full realities of nursing. The policies within most hospitals do not demand recognition or support of these heavy realities, which contrasts to how the auto factory workplaces that James Collins researched "were prohibited from lifting over 35 pounds through the course of their work." Proper body mechanics which was developed to "safely" move patients has been taught for more than 100 years ago under the context of these anarchic and one dimensional gender views. A time when women in the workplace were undermined. In 1898, the textbook, Nursing: Its Principles and Practices made light of the fact that women “occasionally” complained about injuring their backs. The fact that hospitals refuse to invest in equipment, indicates they could be as equally far behind in their view of nurses. Thus nursing employees suffer back and musculoskeletal injuries three times more than construction laborers. The machines that could assist with moving patients, who could weight up to 400 pounds, are viewed as an expensive luxury and not a necessity. Nurturing is often dangerous during emergencies because you are on the front lines to face sickness and in the chaos your wellness can be dangerously neglected. Oftentimes the situation can overwhelm the resources that are available since emergencies are so unexpected. In fact according to NPR "most patients staying in hospitals today are sicker than the patients of 20 years ago". Tove Schuster had to race to lift a patient who weighed more than 300 pounds and that's when she felt something pop. Leesa Evans, a registered nurse, had to rush and lift a 300 pound patient who was dying of congestive heart failure and couldn't move to relieve himself. Her nurturing spirit intensified the rush and days later she couldn't walk. Nurturing can be a major burden that slowly crushes you and weighs you down. Professions deemed masculine are more prone to the one time catastrophic injury and thus are perceived as more dangerous. For example, Michaels sends agency inspectors mainly to factories and construction sites where workers suffer amputations and can get killed. However the wear and tear over time, which is described by as the build up of microscopic tears that block nutrients to discs and eventually cause the disks to collapse, is just as catastrophic and deadly. Nurturing can be dangerous because just like the horrific one time deaths of factory and construction workers, lives are lost. But unlike the construction or factory workers, they lost their lives through sacrifice compelled by nurturing, which is supposed to be feminine and safe. 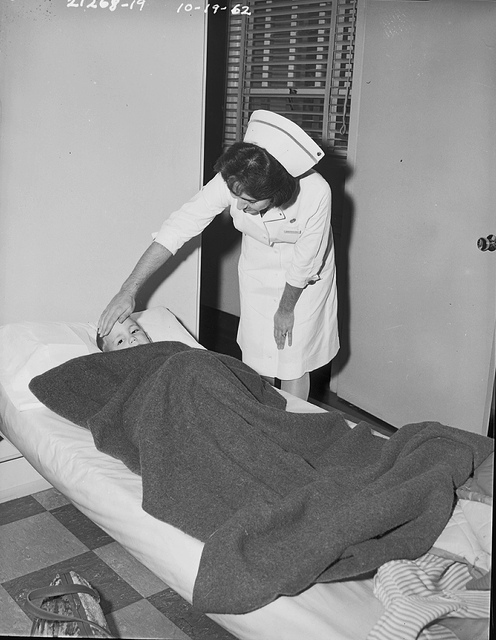 Many injured nursing employees become physically from their lives permanently. Cawthorn couldn't even celebrate her own birthday, even though she helped in the birth of another patient. She was transformed from having a healthy life to one filled with grief and loss. Abigail Velez told NRP, "the pain got so intense and her motion was so restricted that she couldn't pick up a glass of water. 'I could not lift my arm. I couldn't even raise it up to brush my hair'". Leeza Evans' relationship with her husband has been affected since they can no longer garden, ski and hike together. David Michaels, Chief of the Federal Occupational Safety and Health Administration, explained to NPR, "They go home and have real disabilities. They have trouble lifting up their kids. They have trouble doing a lot of the daily tasks of life because of back injuries, arm injuries, shoulder injuries." Since these gendered views of women and femininity in the media and within dominant culture overwhelmingly appear celebrated, the women overestimate how much they will be rewarded and genuinely appreciated for their efforts. Many don't even understand the oppressive implications of this "celebration" until it is too late. In fact in another twist of cruel irony, so many girls and young women who have internalized these glamorized and one dimensional gender expectations, that nurses and nursing employees are undeservingly treated as expendable or as Suzanne Gordon explained to NPR a "disposable labor force". Even if according to a supervisor as an individual like Cawthorn, the injured nurse, is "one of my most reliable employees". This devaluation is supported because every year there will be a guaranteed supply of eager young women because society continues to reproduce these aspirations. This produces a harsh combination of institutional betrayal and, in a broader sense, cultural betrayal. When Cawthorne was ruthlessly terminated, she was "so emotionally destroyed." According to her, " Nursing was not just a job, it's who you are." The institutional and cultural betrayal creates a betrayal of one's identity. Tragically the same culture and structures helped to create that identity. What is the first step that society can take to rectify this issue? I believe that Ashely Moore, a registered nurse in the intensive care unit, sums up the situation the best, "it helps to know that they [nursing employees] do more than measure patients' blood, hook them up to IV and assess how patients are faring. Their work is also physically grueling, and the surging rate of obesity is making it worse."